On December 4th, Boy Scout Troop 1 of Georgiaville invited the public to attend a “demonstration and sale” of Christmas decorations, toys, and gifts at the Esmond Recreation Hall. Six transistor radios were auctioned off, and door prizes awarded. The local Jaycees organization, in conjunction with the local chapters of the National Young Republicans, and National Young Democrats, banded together to participate in Project ACTT, (America’s Christmas Train Truck). The program was administered on the national level by all three groups, with the goal of fostering better public relations between our combat troops in Vietnam and the South Vietnamese people. The project involved a train that would leave Bangor, Maine, and travel to San Francisco, making numerous stops along the way and taking on gifts destined for South Vietnam. There American servicemen would distribute them to the local populace. Suggested donations included everything from hand tools and school supplies, to sewing kits and mosquito netting. Any toys had to be rubber or plastic. Smithfield donations were to be dropped off at the Donald A. Brush Insurance Agency in Greenville. 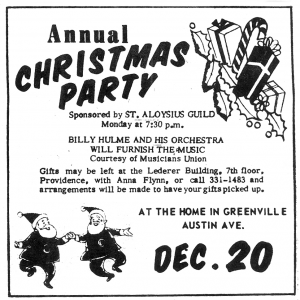 “Play Santa Yourself!” was how one advertisement for a Rhode Island bank began. There was also a picture of a “free” and “colorful” Santa Clause mask, (Yes, a mask.) offered to anyone who opened a Christmas Club account. One would think that advertising Christmas Club accounts would have been done earlier. Another ad suggested that a kitchen appliance would be the perfect gift for the busy homemaker. It read, “Give the dishwasher a dishwasher.” And it was “only $139.95”, but one could buy it on credit for monthly payments of $6.40. The Village Pharmacy, located at 637 Putnam Pike in Greenville, advertised some interesting gift ideas which included a reel-to-reel portable tape recorder, picket sized transistor radios, 2-speed portable record players, Kodak “Instamatic” cameras, and “a fine selection of pipes”. Cub Scout Dens 3 and 7, of Pack 4 of Greenville, won an award plaque for a Christmas display at their monthly meeting held at Anna McCabe School. Den Mothers were Mrs. Elizabeth Pryce, and Mrs. Lorraine Kirkwood. Meanwhile, Cub Scout Master of Pack 4, Donald Mercier of Greenville, reported a need for more Den Mothers. On December 8, the William Winsor PTA held a Christmas party. 5th graders sang carols under the direction of Mr. Harold Lawton, and some of the mothers provided refreshments. In mid-December, the Smithfield High School student council met to adopt a school motto and nickname. The motto: “Truth and Honor”. It was also reported that the student council finalized its preparations for the upcoming Christmas dance to be called “Santa’s Shuffle” scheduled for the 23rd. The “Smithfield Golden Agers” held their Christmas party on December 15th at the Esmond Recreation Hall. New members included Edith Creighton, Blanche Belheumer, Ena Bazino, Aurolia Provencher, and William Wall. On December 17th, the fourth annual Christmas tree lighting ceremony was held on the Greenville Common. Mr. Joseph Lopez conducted a group of carolers as part of the festivities. The tree lighting was part of a community service project sponsored by the Apple Blossom Garden Club of Smithfield. Club members also created an elaborate Nativity scene which was put on display. The Balfour-Cole American Legion Post in Spragueville held its annual children’s Christmas party on December 18. On December 19th the Lincoln Lambrequins performed a Christmas concert at the Greenville Baptist Church under the direction of T. James Hallan. It was also on that night that members of the St. Michael’s Catholic Youth Organization went Christmas caroling along Farnum Pike and through the Homestead Avenue neighborhood. The event had been advertised ahead of time, inviting everyone to join them. The carolers ended their walk in front of Town Hall, where a Christmas party was held sponsored by the Adult Council. The Smithfield Lyons Club continued its yearly tradition of distributing Christmas baskets to needy families in town. Five youths, all of Beverly Circle in Greenville, designed and built a lighted crèche which they put on display in their neighborhood. A photo of the children, which included Paul Lyons, and four members of the Smith family: William, Stephen, Daniel, and Cynthia, was published on page one of a local newspaper.